Vitamin B12, or cobalamin, is an essential water-soluble vitamin needed for red blood cell production, DNA synthesis and a healthy nervous system. The recommended dietary allowance for vitamin B12 is 2.4mcg for males and females 14 and older. Symptoms of vitamin B12 deficiency include anemia, fatigue, suppressed appetite, weight loss and tingling hands and feet. If left untreated, vitamin B12 deficiency can lead to permanent nerve damage, according to the Office of Dietary Supplements. Shellfish are among the richest sources of vitamin B12. A 3 oz. measure of canned, drained clams contains 84.06mcg of vitamin B12. A 3 oz. 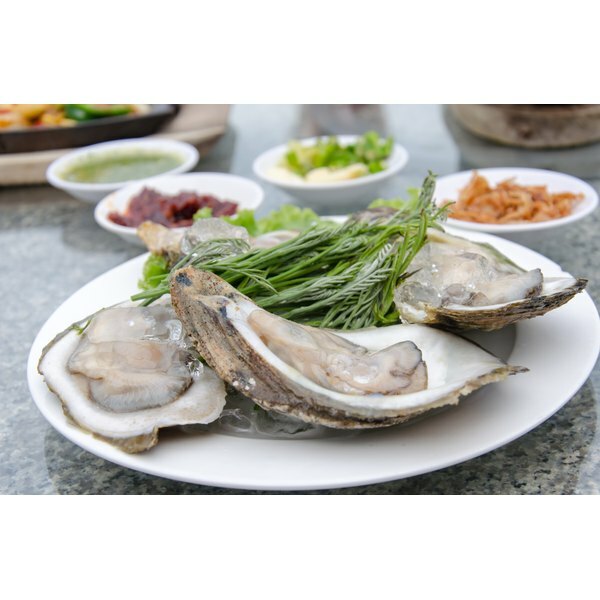 serving of raw clams contains 42.02mcg, and six medium, wild, raw oysters contain 16.35mcg of vitamin B12, according to the United States Department of Agriculture. Three ounces of cooked wild rainbow trout, sockeye salmon, haddock or white tuna contains 5.4mcg, 4.9mcg, 1.2mcg or 1mcg of vitamin B12, respectively, says the Office of Dietary Supplements. Meat is a source of vitamin B12. A 3 oz. serving of pan-fried beef liver contains 70.66mcg of vitamin B12, and two slices of Braunschweiger pork liver sausage contains 11.39mcg. Three ounces of cooked, lean, ground beef has 2.39mcg of vitamin B12, and a 3 oz. cooked, lean shoulder of lamb contains 2.25mcg. One cup of cooked chicken contains 13.69mcg of vitamin B12, and one cooked chicken liver has 3.3mcg, according to the United States Department of Agriculture. Dairy products are sources of vitamin B12 for vegetarians. A 1/4 pint of full fat or semi-skimmed milk contains 1.2mcg of vitamin B12. A 40g serving of vegetarian cheddar cheese contains 0.5mcg. Boiling milk and the fermentation process used in the manufacture of yogurt destroys vitamin B12, according to the Vegetarian Society. One extra large, fresh, raw, whole egg contains 0.75mcg of vitamin B12, says the United States Department of Agriculture. Some plant-based foods are fortified with vitamin B12, including breakfast cereals, yeast extract, margarine and soya milk. One cup of Kellogg's Special K ready-to-eat cereal contains 6.05mcg of vitamin B12, says the United States Department of Agriculture. People at risk of vitamin B12 deficiency, such as strict vegetarians, vegans, older adults and people with gastrointestinal disorders, may benefit from foods fortified with vitamin B12. Fortified foods vary in the amount of nutrients they contain, so it is important to check product labels, according to the Office of Dietary Supplements. Many vegan foods are fortified with vitamin B12, says the Vegetarian Society.